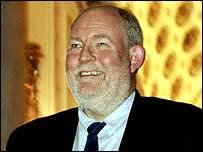 New Home Secretary Charles Clarke has set out his priorities as the Tories raised new questions about the claims which forced David Blunkett to quit. On his first day in the job, Mr Clarke said his focus would be ensuring people could live in peace. He also pledged to push ahead with controversial ID cards. Mr Blunkett quit after an e-mail emerged showing a visa application for his ex-lover's nanny was fast-tracked. The Conservatives want to know if there was an attempted cover up. The e-mail had said "no favours but slightly quicker". Mr Blunkett said he had not been aware of its contents and insisted he had done nothing wrong. Former civil servant Sir Alan Budd found the e-mail during his inquiry into the nanny allegations. His report is expected to be published before Christmas and is likely to prompt new questions. In a letter, shadow home secretary David Davis has asked Sir Alan to say whether any Home Office documents or emails were destroyed. He also wants to know whether officials volunteered new information only after reports in Sunday's newspapers or changed their stories at all. 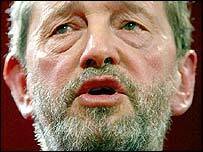 Downing Street on Thursday stressed Tony Blair's "continuing admiration" for Mr Blunkett. A spokesman denied Mr Blair was embarrassed about his staunch support for the ex-home secretary. As he got to work on his new brief, Mr Clarke said his priority was to protect Britain against organised crime and international terrorism "to create a secure country in which everybody can live at peace". First into his in-tray was a judgement from the UK's highest court, the law lords in the House of Lords, ruling that the policy of detaining foreign terror suspects without trial broke European human rights laws. Mr Clarke said the nine currently detained would stay in prison, adding that it was for Parliament to decide whether and how to change the anti-terror law. Mr Blair meanwhile completed the reshuffle by making Stephen Twigg schools minister. Derek Twigg will leave the whips office to become a junior education minister, and James Purnell leaves the back benches to become a whip. BBC political editor Andrew Marr said the prime minister had promoted younger ministers who were "rather in Tony Blair's own image". Mr Blunkett, who is now back in his Sheffield constituency, resigned after the e-mails about the visa application between Mr Blunkett's office and immigration officials were revealed. He said: "I have always been honest about my recollection of events. "But any perception of this application being speeded up requires me to take responsibility." Mr Blunkett told the BBC he had been mortified when the "terrible trauma" of his affair became public. He suggested he had been willing to end his political career to pursue his paternity claim to Mrs Quinn's son. "He will want to know not just that his father actually cared enough about him to sacrifice his career," he said. Cabinet minister Alan Milburn said Mr Blunkett's resignation was a loss to the government but he said he hoped he could one day make a comeback. Liberal Democrat leader Charles Kennedy said his party fundamentally disagreed with many of Mr Blunkett's policies but he was "sad to see someone brought down in this way".